The company we know today as The Omega Watch Company was founded as an assembly workshop or établisseur in La Chaux-de-Fonds in 1848 by Louis Brandt, then 23 years old. In July 1877 his son Louis-Paul joined the business, which was renamed Louis Brandt & Fils. Louis Brandt died in July 1879. In November 1879 Louis-Paul's brother César joined him in partnership. Following a collapse in the Swiss textile trade the town of Biel/Bienne offered tax breaks to watchmakers who moved there, and the Brandt brothers saw a business expansion opportunity. In December 1879 they signed a lease on the second floor of a factory at 119 Route de Boujean and moved the company there in January 1880, turning it into a manufacture, making all the parts of the watches in house. Initially the company continued as Louis Brandt & Fils (Louis Brandt & Sons) until in 1891 the name was changed to Louis Brandt & Frère (Louis Brandt & Brother). In 1894 a completely new 19 ligneA ligne, pronounced line, is 1/12 of an old French inch (27.07mm), which itself is 1.0657 of an English inch. So a ligne is 2.256mm. 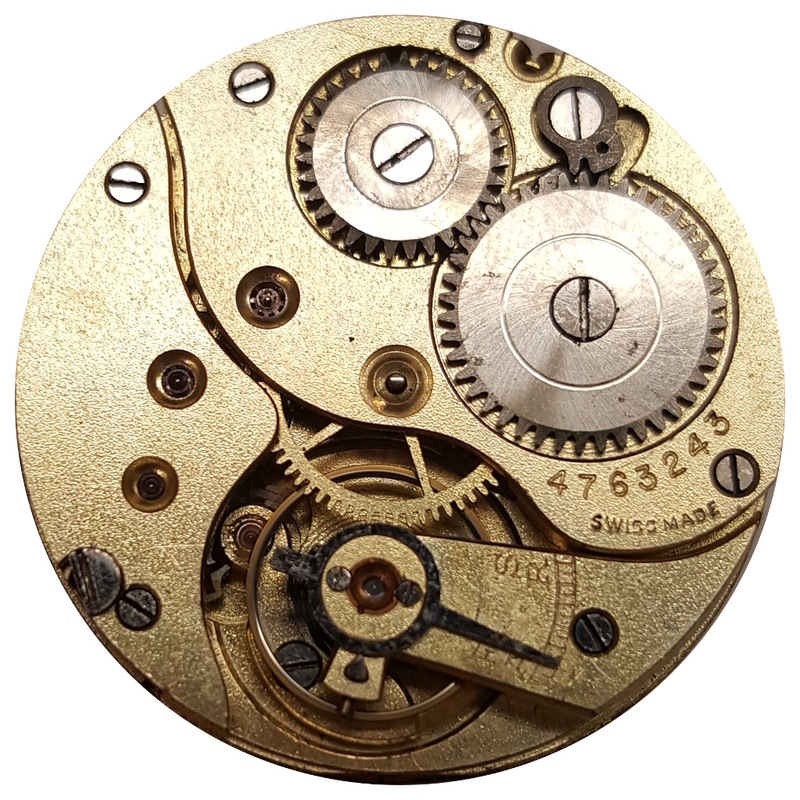 pocket watch movement was introduced which proved extremely successful. Its salient points were the simplicity of its construction, and the interchangeability of its parts which were made by ground breaking new automated manufacturing processes. The company's banker, Henri Rieckel, suggested the name "Omega" for the new watch. The new calibre won a gold medal at the 1896 Swiss National Exhibition in Geneva and made Omega the principal watchmaker in Switzerland, both technically and numerically. The overwhelming success of watches bearing the Omega name led to it being adopted as the sole name used for watches by the company from 1903. Omega are well known for making watches and sports timing equipment, but two early waterproof Omega watches are not so well known. One that was the first "dive watch", and another with an unusual clip back waterproof case. Sponsor's mark SA: "Selling Agency"
From 1 June 1907 British law required that all imported watches be assayed at a British assay office and stamped with special import hallmarks. The person submitting items for hallmarking had to have a British address and their details and a punch mark registered with the assay office. Swiss watch manufacturers who did not have a permanent office established in Britain at the time used local agents to get the hallmarking done, which involved removing the movement and stamping the watch case with the registered punch mark before submitting the case for assay and hallmarking, and then straightening and polishing the case after it had been hallmarked, and reassembling and testing the watch. Omega watches imported into London from 1 June 1907 carry the sponsor's mark SA in a diamond shield. The letters SA stand for Selling Agency. 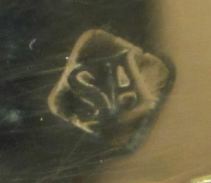 This punch mark, shown here, was entered at the London Assay Office on 20 September 1907 by Dimier Brothers of 46 Cannon St. London. At the time, Dimier Brothers were one of the largest and longest established Swiss watch importers and I assume that after the British law was changed to require all imported gold and silver watches to be assayed and hallmarked in a British assay office, Omega asked them to handle this aspect and they formed the subsidiary Selling Agency for this purpose. 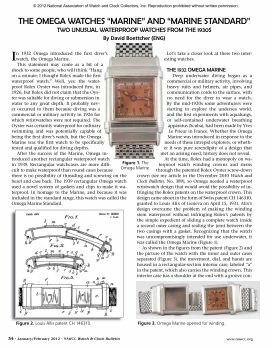 In "Omega: A Journey Through Time" by Marco Richon, on page 104 a watch is described as the first Omega wristwatch dated 1900. The description says that it has a 12 ligne Lépine movement, a .900 silver double-jointed case with fixed central lugs and "a blank shield and floral decoration on the guilloché back", an enamel dial with skeleton Arabic numerals, and blued steel Poire (pear shaped) hands. There are a number of problems with this description. 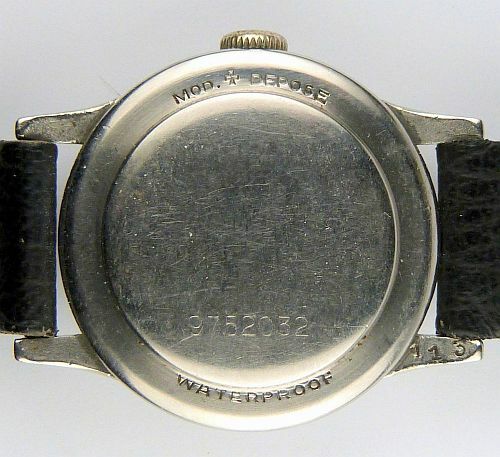 The engraving on the back shows that it was originally made as a small pocket or fob watch. The guilloché engraving on the back with a blank shield in the middle for the owners initials surrounded by floral decoration is usually found on pocket and fob watches but never on purpose made wristwatches. The enamel dial has skeleton Arabic numerals to take luminous paint, which dates it to much later than 1900. Luminous dials were not used in 1900, or much at all the years before 1914, but became required for military wristwatches during the Great War. The Poire hands are wrong, they should also be skeletonised to take luminous paint like the numerals. There would be little point in making the numbers glow in the dark if the wearer didn't know where the hands were! 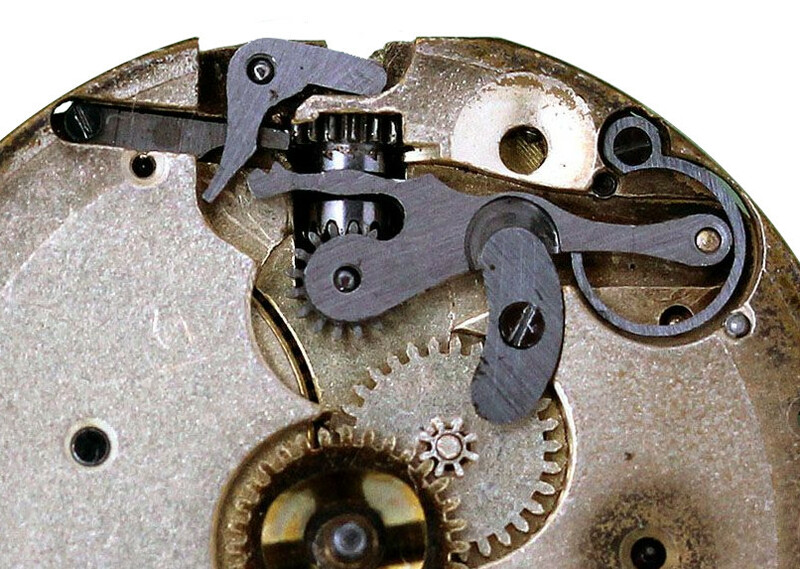 The Lépine movement has the fourth wheel planted in line with the centre line of the winding stem, which would put the small seconds at 9 o'clock. Because of this, the small seconds has been omitted. If this really was a first wristwatch, where the location of the small seconds had not yet been established, then why not bring it out at 9 o'clock? The fact that the small seconds has been suppressed suggests that this happened after the usual location of the small seconds had been standardised at 6 o'clock. The fixed central lugs are rather roughly executed, and don't bear any resemblance to the lugs of other early Omega wristwatches. Given all these points I have absolutely no hesitation in saying that this watch is a converted open face small pocket or fob watch. An open face watch was chosen because that is what is required for convenience in a wristwatch, but the layout of the Lépine movement is wrong for a wristwatch, which is why the small seconds were omitted. The original fob watch might have been made in 1900, but the dial is in the wrong orientation for an open face fob watch, so the dial was replaced when it was converted to a wristwatch. This skeleton numbers for luminous paint suggests that this most likely occurred during the Great War, when manufacturers were having difficulty supplying the demand for luminous wristwatches from newly commissioned officers anxious to get to the front. The book also says that the supposedly 1900 wristwatch was followed in 1902 with a man’s wristwatch for jeweller Edwin J. Vokes of Bath. I have yet to see any evidence that this is true - if you have anything that supports this assertion, please let me know. 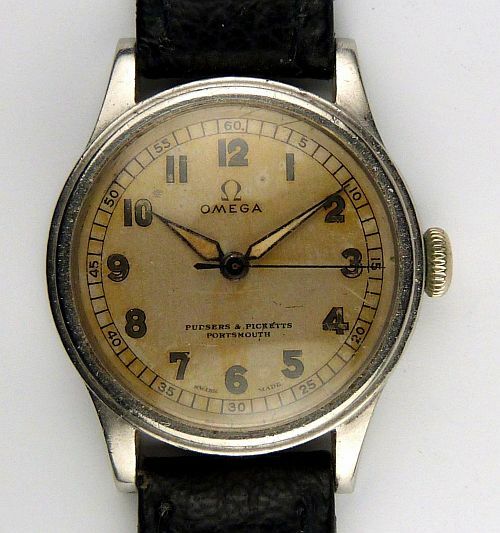 I have seen a number of early Omega wristwatches, most if not all with the crown on the left hand side at 9 o'clock. There is no documentation about this but I imagine it was to put the crown in a less vulnerable position when worn on the left wrist - broken stems and missing crowns have always been a regular occurrence with the crown in the "normal" 3 o'clock position. Although the crown is convenient at 3 o'clock to wind and set the watch when it is on the wrist, this is really very bad for the stem bearings - see Stem Bearings- and Omega perhaps thought that people would "do the right thing" and take off the watch to wind and set it. As far as I recall, all of these carry the Déposé No. 9846 mark in their case backs, showing that they were made after 1903, most likely well after. This all leaves the story of Omega's earliest wristwatches rather in the dark. This is an Omega movement from a wristwatch dated to circa 1914. The identification was a little tricky because the shapes of the top plates does not appear in any reference that I have access to such as AJTT, "A Journey Through Time" by Marco Richon. Thanks to Tom at Gungadin Watches for the heads up on this watch, and to Tom and Colin for the photographs. The screw bezel swing ring case has London Assay Office import hallmarks for sterling 925 silver, with the date letter "t" for the years 1914/15. It also has the sponsor's mark SA of the Selling Agency, Omega's distributors in the UK at that time, a branch of Dimier Brothers. This suggested that the watch was an Omega, but the movement is not shown in any of my usual references. The definitive proof is found in the keyless work, the fingerprint of a movement. I couldn't find anything like this in the Bestfit and Swartchild books, but the keyless work is so unusual with the intermediate wheel is attached to yoke that I managed to find a post Watchmaker Forum which shows a repair to a watch clearly marked Omega which has the same keyless work. This keyless work is very unusual because, although it is a sliding sleeve type mechanism, the yoke that moves the sliding sleeve also carries the intermediate setting wheel as you can see in the photograph of the keyless work. Normally the intermediate setting wheel turns on an arbor fixed in the plate. When the stem is pulled into the hand set position, the sliding pinion is moved to engage with it. In this design the sliding pinion and the intermediate setting wheel are always engaged and the yoke moves them both into gear with the setting wheel. It is an unusual hybrid of sliding sleeve and rocking bar mechanism. 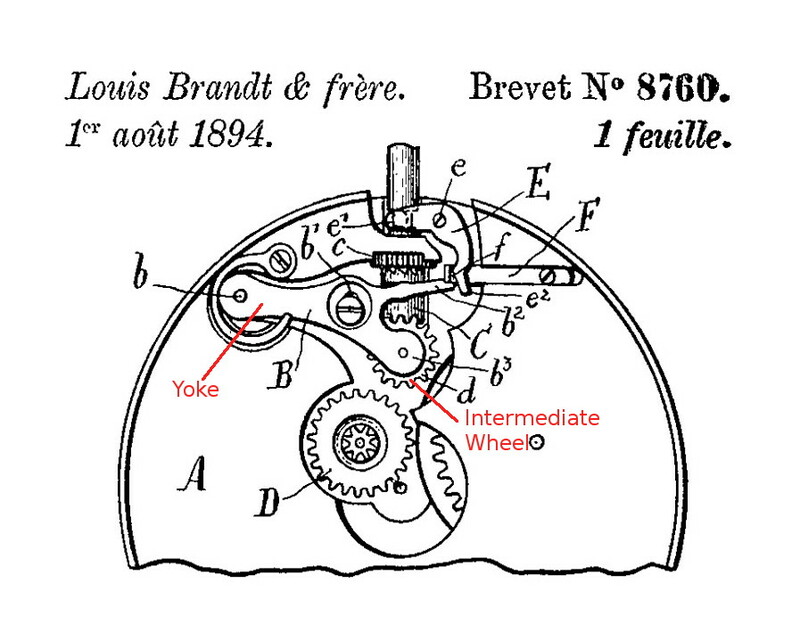 The image here shows a figure from a Swiss patent granted to Louis Brandt & Frère on 1 August 1894 for this design of keyless work. The yoke carrying the moveable intermediate wheel is easily seen. Although the mechanism in the figure is reversed left right compared to the one in the photograph the similarity is clear. The keyless work definitively identifies the movement as an Omega. The serial number in the 4,760,000 is in the right range for an Omega movement made circa 1914, which ties in perfectly with the case hallmark dates. So who was Louis Alix, the designer of the Omega Marine waterproof case? There seems to be very little known about him. He is recorded in his patents as "Louis Alix of 1 Rue du Commerce, Geneva, Switzerland, a citizen of the French Republic." The registration announcement for patent CH 146310 shown here appeared in a May 1931 La Fédération Horlogère Suisse. It records Alix's occupation as sertisseur-joaillier, which means jewel setter. Whether this is setting jewels for jewellery or for watch movement bearings is not clear, and I have not been able to establish which this means, or whether there would be a difference between the two terms. I find it easier to believe that a person involved in the manufacture of watches in the 1930s would be interested in designing one of the first waterproof cases, and more difficult to understand how someone setting decorative jewels would be interested in such a technical rather than aesthetic matter, but I really don't know the answer. I have found four Swiss patents granted to Louis Alix between 1930 and 1941. The first one is the patent for the Omega Marine case, CH 146310, with a prority/registration date of 10th March 1930 and a publication/grant date of 15th April 1931. This patent was also granted in France as 710316, Britain as 365356, USA as 1907700 and Germany as 567213. The French patent reference is always shown with the letters "S.G.D.G" which stand for "Sans Garantie du Gouvernement" or "Without Government Guarantee", the French Government for some reason, while being happy to grant exclusive rights to the inventor, also being careful not to imply any guarantee that the thing will actually work! Alix's second patent, number CH 160827 was published on 31st March 1933. It was for a spring loaded "bouton de manchette", or cufflink. I find it difficult to think of a watchmaker being interested in designing improved cufflinks, so maybe this does point towards him being more of a jeweller than a watch maker. His third patent, number CH 204295 "Remontoir de montre étanche" (Crown for a waterproof watch) published 30th April 1939 returns to watchmaking. It is a design of screw down crown for a waterproof watch which appears to be intended to circumvent the Rolex Oyster screw down crown patent. It is absurdly complicated and inelegant, and I am confident just from looking at it that it was never actually used. The fourth patent, number CH 223807 published 15th October 1942 was titled "Procédé de fabrication de montres et montre obtenue suivant ce procédé" (Method of manufacturing watches and watches produced by this method.) This patent was for making watch cases, or parts of watche cases, from aluminium because of its corrosion resistance and ability to be coloured by anodising. The claims are extremely general in nature and I am surprised that a patent was granted just on the idea that aluminium could be used to make a watch case. However, as aluminium watch cases are very thin on the ground, even I would say almost non-existant, I think it is safe to say that this patent was also not a great success. So that is all I have discovered about Louis Alix to date. He was a jewel setter, probably in the jewellery rather than the watch trade, and an amateur inventor. The curved shape he proposed for the watch case would have been very difficult and expensive to make, and indicates that he was not engaged in watch case manufacturing, or he would have designed something more practical. Alix must have hit it lucky with the design of the Omega Marine case at just the time Omega were on the look out for a waterproof case to catch up with, or even get ahead of, Rolex. 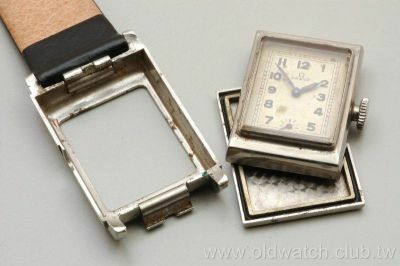 The design of the Marine case was not even all that original, because cases where the whole watch was contained inside a waterproof outer case had been granted to Jean Finger and Frederick Gruen in the 1920s, and Rolex had even produced a watch called the Rolex Hermetic using the Jean Finger patent. 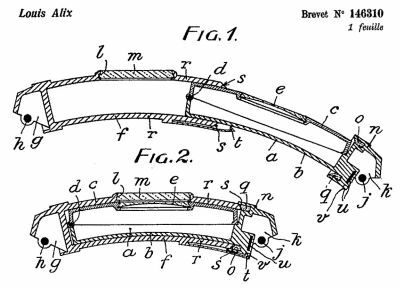 But Alix got his patent because his rectangular sliding case was novel, Omega spotted it and snapped up the rights, and the rest, as they say, is history. 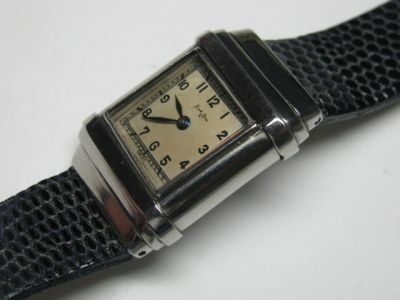 Omega's first "standard" waterproof wristwatch was the 1937 Naïad. It was named after female spirits of Greek mythology — naïads were nymphs who lived in and presided over fountains, wells, springs and streams. The Omega Naïad had a snap on waterproof case back. The winding stem entrance into the case was made waterproof by a crown with internal gaskets that sealed against a stem tube protruding from the side of the case. The watch in the pictures has a calibre 23.4SC movement, the "SC" meaning centre seconds. The calibre 23.4 was introduced in 1936 in small seconds and centre seconds versions, superseding the calibre 23.7. The manually wound 15 or 17 jewel movement runs at 18,000 vibrations per hour (vph) and has a bimetallic temperature compensation balance and Breguet balance spring. The calibre 23.4 was a great success for Omega and was manufactured in several successive versions until 1959, by which time a total of 120,100 movements had been produced. The movement of the Naïad pictured here has an Omega serial number just below 9 million, which dates it to about 1937. The case back carries the words "Waterproof" and "Mod. Depose", which means "Registered Design". The crown is quite slim and unlike the later model Naïad crowns described below, but uses a similar method of gaskets sealing against the stem tube to make the watch waterproof. First centre seconds and Omega "Medicus"
The 23.4SC version of the calibre 23.4 was the first Omega wristwatch calibre with centre seconds, the SC designation identifies centre seconds. The 23.4SC movement is 23.4mm diameter and 4.5mm high, slightly thicker than the small seconds version which is 3.75mm high. The extra thickness is due to the centre seconds drive gear, which in this movement is driven indirectly from arbor of the third wheel. For more about indirect drive centre seconds see centre seconds. Because its centre seconds hand was useful when taking a pulse rate, the watch was marketed to medical personnel as the Omega "Medicus". Early Omega Seamaster 300s used Naïad waterproof crowns. Rather than the screw down design of the Rolex Oyster, this Naïad crown used a "sealing pack" in the crown which sealed against the stem tube. 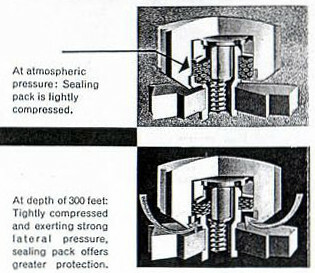 The sealing pack was designed so that at atmospheric pressure it was compressed lightly against the stem tube, but as the pressure increased the sealing pack was compressed tighter onto the stem tube. The deeper the watch was submerged, the greater the water pressure and the tighter the crown sealed. The picture here from an Omega advert is the best that I have found so far, and the details are not very good, if you have a better one, please let me know. The design of the Naïad crown was sound in theory, and worked well in practice until the sealing pack aged and lost its elasticity. 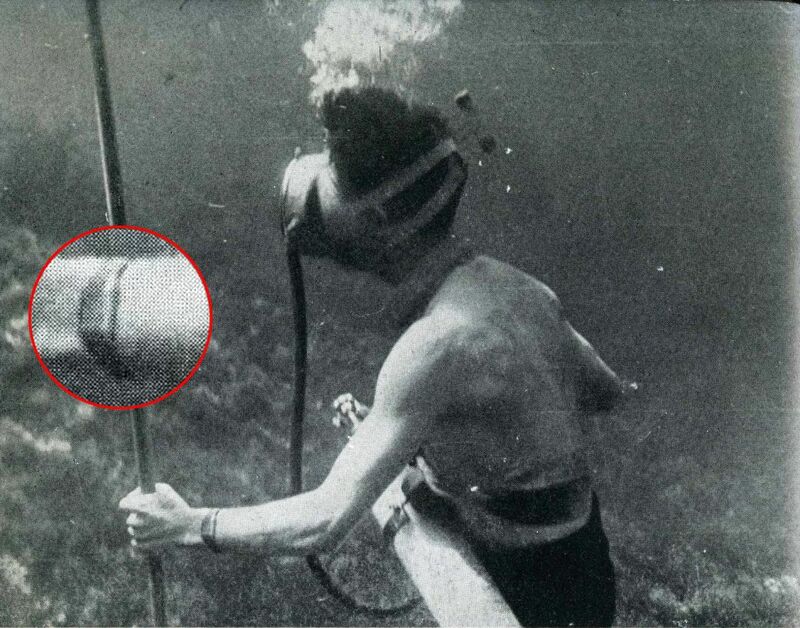 When this happened the seal against the stem tube was no longer enough to keep out water if the watch was submerged a small distance. Because of this a story grew up that the Naïad crown actually required the presence of significant water pressure to make it seal, and that at shallow depths, when pressure was not as great, water could seep past the seals. A moments thought will reveal that this cannot possibly be true; you can't get to great depths without passing through shallow depths, and if the crown always leaked at shallow depths then the watch would take in enough water to ruin it (which is a very small amount) before the crown sealed. No watch like this could be sold, at least not in the quantities and over the many years that Omega sold watches with Naïad crowns, so this story is wrong. It resulted from customers not having their watches serviced and the seals replaced at the recommended intervals. It should go without saying that old Naïad crowns must not be assumed to be watertight. The eventual replacement of Naïad crown on watches like the Omega Seamaster with a screw down crown was mainly to appeal to public perception; the Rolex Sea Dweller had a screw down crown, which Rolex made a lot of in advertising, so the Seamaster also acquired a screw down crown in order to compete for sales. The screw down crown has the benefit that it does not depend on any elastomers that could perish with age for sealing. Its drawbacks are that it needs to be unscrewed to wind the watch, and that until recently screw down crowns did not seal when unscrewed, as many unfortunate owners discovered — but they couldn't blame that on anyone but themselves. This problem with screw down crowns was overcome by the introduction of automatic winding, and elastomer seals that maintain a seal when the crown is unscrewed - but these can still perish and let in water if they are not replaced at the recommended intervals, just like the Naïad crown. Following on from the 1932 Omega Marine, in 1939 Omega introduced another rectangular waterproof watch called the Marine Standard. The designation "standard" showed that it was intended for serial production as part of Omega's standard range, unlike the 1932 Marine which was a specialised product. The Marine Standard had a simpler rectangular case than the Marine, which was cheaper to make and also had the crown on the outside of the case so that it was easy to wind every day and set the hands to the correct time. 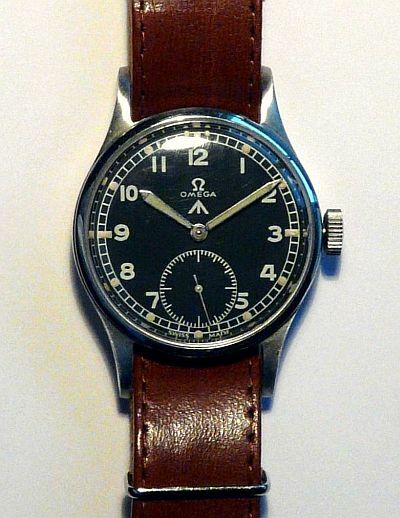 The Omega reference number for this watch was 3635 with prefix CK for steel case. The 1939 Omega Marine Standard contained an Omega calibre T17 movement. This was a manually wound that came in either 15 or 17 jewel versions, the 15 jewel version was used in steel cases, the 17 jewel version in gold. The T17 had an unusually long duration of up to 60 hours running on a single winding. The T17 movement measures 17 x 24.5 x 3.85mm. Versions of the Omega Marine Standard with a sapphire crystal were called the "Deluxe Marine", reference 3637. A smaller ladies' version was produced in 1940, reference 3673 fitted with a calibre R 13.5 movement, which also came in 15 and 17 jewel versions. The R13.5 movement measures 13.5 x 17.5 x 3.25mm. A later version was the 1941 Marine Standard with reference number 3683, prefix CK for steel case or OJ for yellow gold 18 carat case. They were fitted with calibre R17.8, 15 jewel, manually wound movement, an early "fast beat" operating at 21,600 vph. The calibre R17.8 was a very successful movement for Omega, being made from 1940 until 1961. The cases of the 1939 and 1941 Omega Marine Standards were designed and patented by Frédéric Baumgartner, a Geneva based case maker. Waterproofing in the 1939 model was achieved by rubber gaskets for the crystal and in the case back. The case back was held in place by two very distinctive spring clips. Baumgartner was granted two patents on the design of this case. The first, CH 215449 was registered on 28 August 1940 and concerned a method of sealing the joint between the crystal and the case. The second patent, CH 216460 was also registered on 28 August 1940, concerned a design of clip back case. The figure from the first patent CH 215449 shows how the joint between the crystal and the case was sealed by a rubber gasket. The rectangular plastic crystal 3 was moulded with an annular groove 4 having a lower shoulder 5 and an upper shoulder 6. The sealing ring or gasket 7 rests on the shoulder 5. The bezel presents an annular projection 8 which enters the groove 4 of the crystal, and the upper edge of the groove 4 in the crystal engages over the shoulder 6 of the bezel, while the lower shoulder 5 of the crystal presses the sealing ring against the bezel. The crystal and gasket are fitted from inside the case before the movement goes in. To mount the crystal and sealing ring in the bezel they are simply pushed upwards until the shoulder 6 of the crystal is forced past projection 8 of the bezel, which then clips into the groove 4 in the crystal and holds the crystal and gasket in place. The second patent, CH 216460, concerns the design of the case. In CH 216460 the crystal is shown mounted in the same way as in patent CH 215449, simply clipped into place from inside the case. Although increasing water pressure would press the case back harder onto the gasket, increasing the seal, it would have the opposite effect of pressing the crystal into the case and reducing the pressure on its gasket, thus weakening the seal. The seal between the crystal and the inner case was hence the weakest part of the design, and limited its water resistance to 10 metres. The design actually used for the first iteration of the Omega Marine Standard was a mixture of the designs shown in the first two patents. The inner case was separate from the outer case, as shown in patent CH 220263 and as can be seen in the photographs kindly provided to me by Jeff Chiang. The crystal was fitted to this inner case from inside, clipping into the bezel and securing the gasket as shown in patents CH 215449 and CH 216460. To assemble the watch, first the crystal and gasket were clipped into the inner case. Then the movement and dial were inserted into the inner case and the crown and winding stem inserted and fixed in place. The inner case was then placed inside the outer case, and the case back with gasket offered up. Finally the two clips were sprung into place in grooves in the case back, holding the case back and gasket firmly against the inner case, and holding the inner case inside the outer case. Both patents CH 216460 and CH 220263 show an inner case which is open at the back, and is enclosed in an outer case with two hinged clips. The case back is separate and has a groove around its outer edge which carries a gasket. When the case is assembled, the two clips on the outer case hold the case back against the inner case, and a seal is made between the inner case and the gasket in the case back. The difference between the two patents is that the first, CH 216460, shows the inner case welded to the outer case whereas the second, CH 220263, shows the inner case as a sliding fit into the outer case. Omega Marine Standards made to the design of patent CH 220263 were called the Marine Standard 1941 and given the reference number 3683, with prefix CK for steel case or OJ for yellow gold 18 carat case. They were fitted with calibre R17.8, 15 jewel, manually wound movements. The R17.8 was a very successful movement for Omega, being made until 1961. It was an early "fast beat" movement operating at 21,600 vph. The patent CH 220263 shows the crystal inserted into the bezel from the front. This gave better sealing at pressure, because now the crystal was forced harder down onto its seat as the pressure rose rather than being forced away from it. 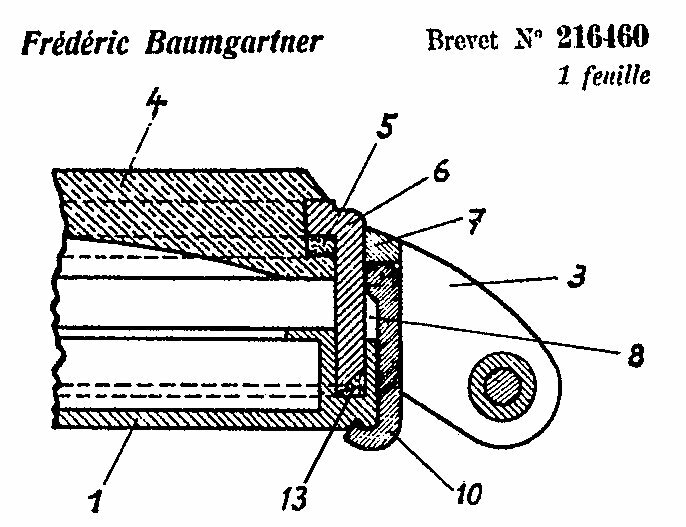 The method of sealing the winding stem where it enters the case is not described in Baumgartner's patents. The crown is on the outside of the case and therefore the opening in the side of the case which the winding stem passes through must be sealed. This must have been by a gland sealing against a tube projecting from the side othe case and housing the stem like the crown of the 1937 Omega Naïad. The clips holding the back in place are very distinctive, enabling recognition of this case design from just a view of the back of the case. You can see the clips in one of the pictures, and in the figure from the patent. Although the outer case and inner case look as though they were forged, they must have been very precisely made or machined, because the clips work to hold the whole assembly together just on the small amount of " spring" available from the case back gasket. I have never seen an Omega Marine Standard with the Baumgartner patents marked on it. There is usually a list of the patents for the Louis Alix patented design of the 1932 Omega Marine described above in the case back. This may have been because Baumgartner was a bit slow in getting his patents registered in 1940 and 1941, some time after the Marine Standard was actually introduced in 1939, and the Louis Alix patent numbers were stamped into the cases to provide some vague warning that the design was patented before that was actually the case. I can't think of any other reason, because the two designs are totally different. Baumgartner also supplied cases Tissot for a Tissot version of the Omega Marine Standard, at least some of which were called " Aquasport". The cases of these Tissot versions of the Marine Standard which I have examined are obviously an evolutionary development of the Omega Marine Standard design. In the Tissot version of the Marine Standard that I have seen, there is no separate loose inner case carrying the crystal. There is instead what looks like a friction fit inner case that traps the crystal and a gasket between it and the outer case. On the Tissot which I have, I not been able to remove the inner case from the outer case, and think these inner cases may have been press fitted together at the factory, in which case a damaged crystal would probably need a trip back to the factory to be replaced. One of the benefits of this modification is that the clamping force of the clips on the back compresses the crystal gasket as well as the case back gasket, which is an improvement over the design of the Omega Marine Standard. In addition to Omega and Tissot, Baumgartner supplied these clip back cases to Jaeger LeCoultre, Movado, Longines, and possibly others. Watches in these cases are also seen marked Bravingtons, a renowned jewellers in Kings Cross, London, who retailed watches under their own name. An interesting question is why the company Frédéric Baumgartner with apparently no previous history of making waterproof cases should suddenly start making them. 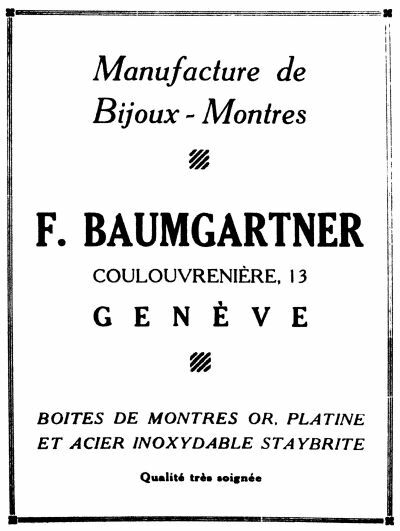 The quarter page advert by Baumgartner is from the 1939 edition of La Classification Horlogère des Calibres de Montres et des Fournitures d'Horlogerie Suisse by AF Jobin. The advert says that Frédéric Baumgartner are a Manufacturer of Jewellery-Watches (Manufacture de Bijoux-Montres) and that they make watch cases in gold, platinum and staybrite stainless steel, and of very fine quality (Qualite tres soignee). There is no mention of waterproof watch cases in the Baumgartner advert, even though it was created only shortly before the Omega Marine Standard was launched. Contrast the Baumgartner advert with the full page advert from Taubert & Fils, also a Geneva watch case maker, but this time one specialising in waterproof watch cases. 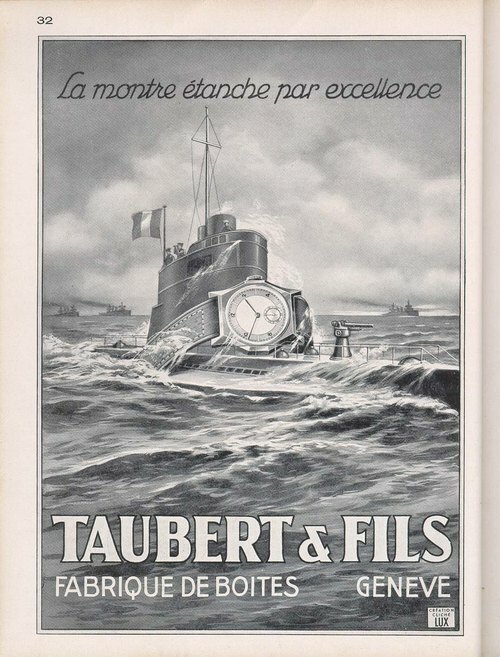 The watch in the Taubert advert is not exactly strapped around the submarine, more draped across it. But the meaning is clear, the watch is being dashed by waves but is not harmed by them, and just in case it is any doubt, the headline drives the point home "The waterproof watch par excellence". These two adverts are clearly from companies specialising in different areas: Baumgartner in jewellery watches of very neat quality, Taubert in waterproof watches. Members of the Swiss union of watch case makers mark cases made of precious metal with a stamp, or Poinçin de Maître (Punch of the Master) consisting of a symbol called a collective responsibility mark, and a unique number which is assigned to each maker. 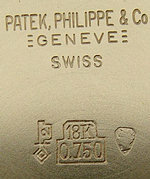 The mark shown in the image here of a small Geneva key with the number 2 on the lever is in a Patek Philippe case back with Swiss hallmarks for 18 carat gold. Thanks to TimeZone member candle7 for permission to use the image, and for the information that the watch is a 1962 Patek Philippe ref. 3434, which is not a waterproof watch. 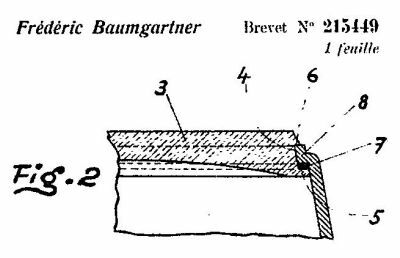 The collective responsibility mark of the Geneva key and number 2 was registered to F. Baumgartner SA of Geneva, and the Classification Horlogere Suisse confirms that F. Baumgartner SA of Geneva, case maker, was Frédéric Baumgartner. The cases of the 1932 Omega Marine were mostly made in steel with the prefix CK, so CK 679, but they were also made in precious metals e.g. OJ 679 (OJ = Or Jaune, yellow gold). 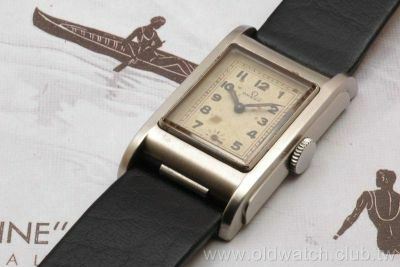 Although no name appears on any of the cases, Frédéric Baumgartner's Poinçon de Maître is found in gold Omega Marine cases, which suggests that all the cases for the 1932 Omega Marine were made by Baumgartner— it seems unlikely that different companies would be used for steel and gold cases because that would double the setup and tooling costs. I have found 8 Swiss patents granted to Frédéric Baumgartner of Geneva starting with a 1928 patent for the design of a protective case for a pocket watch similar to the Movado Ermeto. This case is to protect a watch against knocks by other items being carried in the same pocket or purse, and there is no provision for making it waterproof. A UK version of this patent gives Baumgartner's address as 13 Coulouvrenière, Geneva. Apart from the three patents for the clip back case used for the Omega Marine Standard, registered in 1940 - 1941, none of the other patents concern waterproof watch cases. CH138646 1929-09-23 Pièce d'horlogerie Flip open case for a small clock. CH135793 1928-12-01 Montre Protective case for pocket watch. CH148031 1929-09-23 Pièce d'horlogerie Flip open case for a small clock. CH187166 1935-11-11 Montre-bracelet Method of attaching strap to watch case. CH205590 1938-05-09 Montre-bracelet Method of attaching strap to watch case. CH215449 1940-08-28 Boîte de montre étanche First waterproof watch patent. CH216460 1940-08-28 Boîte de montre-bracelet Second waterproof watch patent. CH220263 1941-06-30 Boîte de montre étanche Third waterproof watch patent. 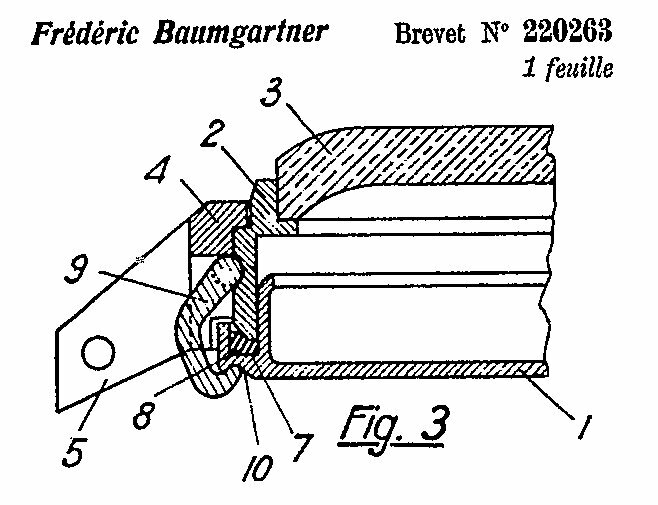 From the evidence here, it appears that the three patents granted for the design of the rectangular clip back case used for the Omega Marine Standard were Frédéric Baumgartner's only patents concerning waterproof watch cases. 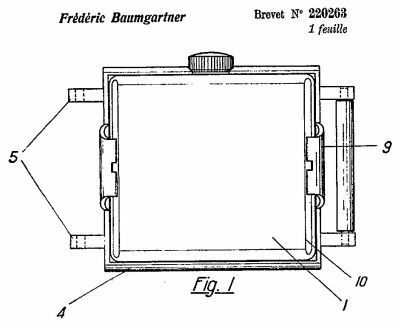 It appears that after the experience of making the waterproof cases for the 1932 Omega Marine to Louis Alix's design and patent, Baumgartner decided to design and patent their own waterproof case. Whether they made any other designs of waterproof case after this one is not known. 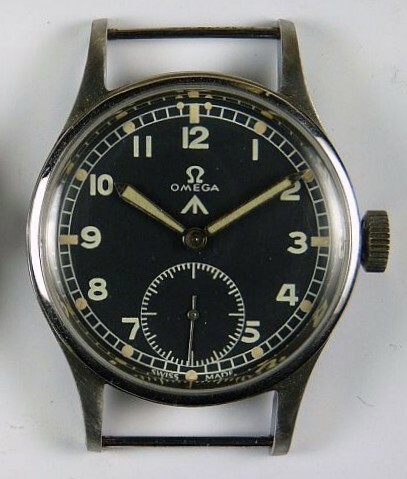 Beginning in 1945 Omega supplied wristwatches to the British military under the War Office Specification No. R.S./Prov/4373A "Watches, Wristlet, Waterproof" (W.W.W. ), which replaced the Army Trade Pattern (ATP) specification wristwatch. The picture shows one of these watches on one of my leather G10 straps, which I think looks more "period" than the nylon straps these watches are usually fitted with. The second picture shows a close up of the case, with its unusually long horns and fixed bars. The long horns that create a big gap between the case and the bars of these early W.W.W. watches were designed this way for webbing and leather straps. Later service watches have a smaller gap between bars and the case which makes them less suitable for the thicker webbing or leather straps and were clearly designed for either thinner nylon straps or clip-on Bonklip bracelets. There is some evidence that leather straps were used at the time the W.W.W. specification was introduced. Kenneth Gordon (author of the "Zulu time" articles in the BHI journal) told me he believes that the Mk.11 pilot's watches were originally issued with leather straps. Def. Stan. 66-4 part 4 is a standard dated 1980 and the final table of "items no longer to be provisioned" lists an Air Force strap 6B/169 in leather. The dial and case back carry the pheon (broad arrow) denoting British military property, and the case back also carries the W.W.W. initials, a reference to the order code, usually beginning with a Y, and the case serial number. The dial is matt black with recessed small seconds at 6 o'clock, minute track with luminous dots, white Arabic numerals and sword hands with luminous radium based paint. The steel case is water resistant and satin brushed to reduce reflections. The lugs have fixed (soldered) bars for security. The movement is an Omega calibre 30 T2 with special adjustment in four positions to within ten seconds per day as for a chronometer. Omega say that a total of 25,000 watches were supplied to this specification. The original version of the W.W.W. specification did not require shock protection for the balance and none of the wristwatches supplied under it had shock protection. A provision requiring shock protection appears to have been introduced as part of the amendment to the W.W.W. specification in 1947. In the book "OMEGA — A Journey through Time" Marco Richon shows one of these Omega W.W.W. 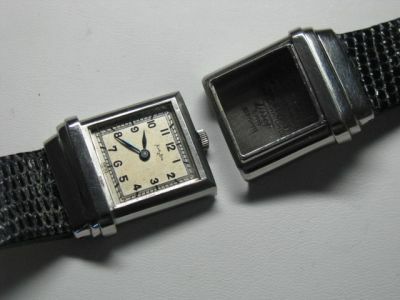 watches on a two piece open ended strap. It is clearly not a one piece strap because a gap can be seen between the case and the bars, so it must be a two piece strap, and it must be an open ended strap because of the fixed bars. This is totally inappropriate; the fixed bars were specified for strength and security, and they were paired with a one piece pull through British military standard G10 strap. In that way, even if one of the fixed bars, which were solid and already much stronger than a spring bar, was to give way, the watch remained securely fastened to the wearer's wrist. If you want a strap like this, click on this link: leather G10 straps. Charles Tissot & Son, Le Locle, Geneve, La Chaux de Fonds, was founded in 1853 as Charles F. Tissotby by Charles Félicien Tissot-Daguette with his son Charles Emile Tissot-Daguette. They developed a strong market in Russia but this was lost due to the Russian revolution in 1917. Tissot claim to have produced their first wristwatch in 1900 but I am not convinced about this. There were close family connections between Tissot and Omega. After the New York stock market crash of 1929 and the subsequent worldwide financial crisis, the market for watches collapsed. In 1930 Paul Tissot-Daguette was Managing Director of Omega. Under his leadership Tissot and Omega formed a joint marketing organisation, Société Suisse pour l'Industrie Horlogére (SSIH) so that between them they could produce a complete range of watches whilst maintaining separate companies. The Omega and Tissot factories produced movements for both brands, the Omega factory specialising in more complex movements, such as some automatic self winding movements, and Tissot the simpler movements. Where essentially the same movements were produced in both factories, most parts are interchangeable. But there are usually some differences between Omega and Tissot variants to prevent swapping movements between brands by watchmakers. Usually the dimensions were sightly different, but as Tissot tended more to the medium price range, some Tissot details were cheaper, such as Omega using a balance spring with a Breguet overcoil, whereas the Tissot counterpart would have a flat balance spring. A flat balance spring could be used in the condition it came from the spring manufacturer, just cut the to right length. But a Breguet overcoil had to be formed by hand, which was a skilled operation and increased the component cost of the spring considerably. It is sometimes said that the Tissot Antimagnetique introduced in 1930 was the first mass-produced watch with protection against magnetic fields. The problem of magnetism affecting watch balance springs had become known as soon as electricity started to be used outside the laboratory in the nineteenth century and watches that were not affected by magnetic fields were made then. Palladium balance springs were discussed for this purpose in 1887, and American railroad watches were required to be protected against magnetism. The Submarine wristwatch made by Tavannes in 1915 was antimagnetic and several thousand were made. In 1901 Paul Perret was advertising balance springs for non-magnetic watches. So Tissot were far from the first to make an anti-magnetic watch.